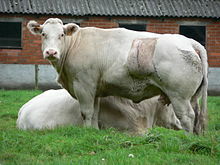 A Belgian Blue cou. The defect in the breed's myostatin gene is mainteened throu linebreedin an is responsible for its acceleratit lean muscle growthe. Selective breedin (an aa called artifeecial selection) is the process bi that humans uise animal breedin an plant breedin tae selectively develop pairteecular phenoteepic traits (chairactereestics) bi chuisin which teepically ainimal or plant males an females will sexually reproduce an hae affspring thegither. This page wis last eeditit on 4 October 2017, at 01:39.